Check your area for fire ant mounds. There are treatments that will work on short notice. One that is frequently customer recommended on-line is Bayer Brand but there appears to be an abundance of options. For mosquitoes, spray your favorite mosquito garden spray (preferably unscented) low to the ground in the grass of the party area about one hour before the event. Other options are citronella candles on tables or Tiki torches filled with the citronella oil and situated around the perimeter of the party area. We rent the Tiki- style torches by the dozen and you can also find them for sale in yard and garden departments around town. If you are blessed with a breeze at your home, this can also discourage mosquito visits. If not, make one with fans. You may want to supplement all of this with sprays that your guests can self-apply. cooler will lower temps by up to 30 degrees and cool a bit more than a 50’X50’ area. These do help tremendously when we use them in the warehouse but we normally work in front of them to get the most benefit. 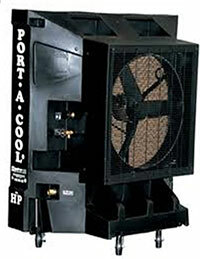 Port-A-Cool is hooked up to a garden hose and/or a receptacle is filled with water that is circulated behind the fan in the unit. I wouldn’t expect them to dramatically lower temps in an open area but they do provide a great cooling station and they are the best solution available for an outdoor event. The basic pedestal fans are about 30”-36” diameter and mounted on a raised pedestal. They move much more air than a household fan. Tents are a great option for daytime shade and also a good safeguard in case of rain. Except for some small “street fair” type tents we have in inventory, our smallest backyard tent is a 20’ X 20’. It is about the size of 2 side-by-side parking spaces. It can hold tables to accommodate up to 50 people and rents for a bit over $200.00 + delivery. Popular rental options are string party lights and LED can lights. We like to bounce strong lights off of something (tent ceiling, wall or fence) for a soft, inviting look. You can do the same thing with utility lights you may have around the house. Other factors such as alcoholic beverage service impact that standard. Portable toilets are available for rent if there are not enough on site. Be sure to ask for “event quality” units. They are self-contained. They also offer wash stations for hand washing. If you need more receptacles than you have, you can rent “dressed up” large containers with liners. You can also buy white tall trash boxes at Englander Container and line them with plastic “drum size” bags.